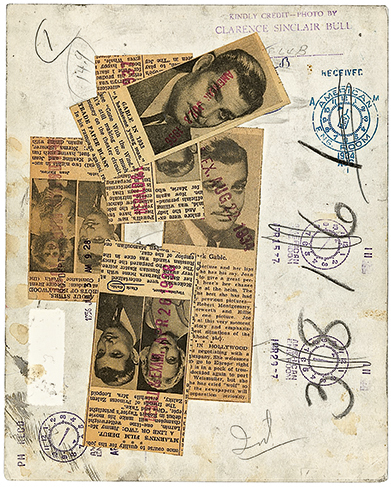 Each image shows the markings of newspapers’ in-house retouchers, who used dark paint, crayon and ink to enhance, amend and edit the images, and to indicate crop marks for page layout. This crude editing process was necessary, even for seemingly flawless pictures, to ensure optimal reproduction quality when published. Decades before the advent of Photoshop, these markings create a new aesthetic that goes beyond the photograph’s initial subject matter, each becoming a one-of-a-kind artefact. 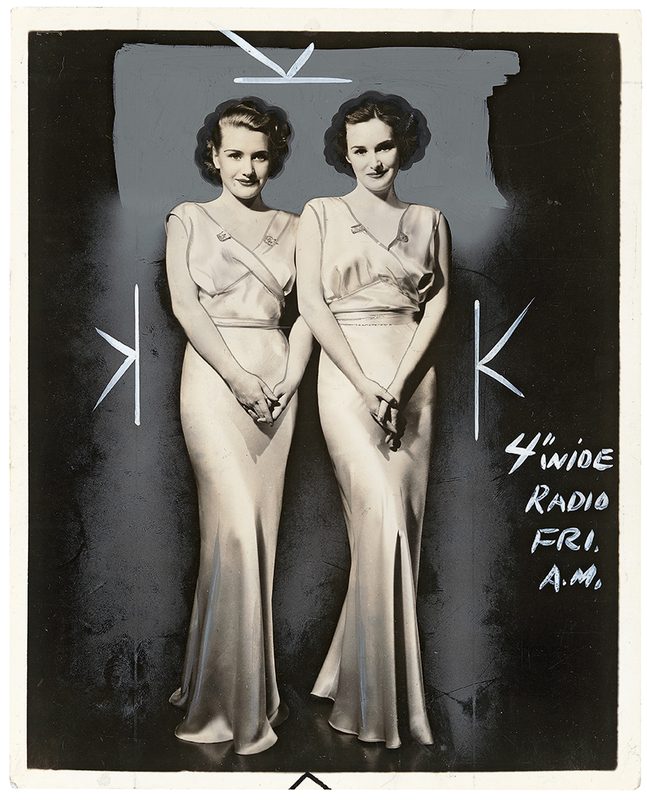 Top: Promotional photo of Priscilla (left) and Rosemary Lane, singers and film actresses, 1936. Publisher unknown. To Pellicer, no collection is forever, and the time has come for him to sell the prints individually to fund his next project. This will consist of various double-exposed photographs. ‘The aim is not to have the prints, but to make something with it … when it’s made, you sell everything and start anew’, said Pellicer. 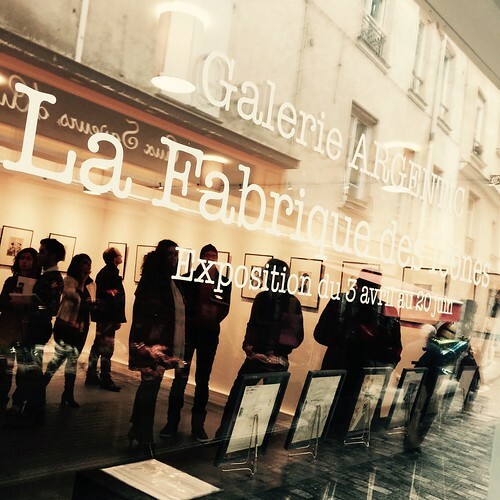 The opening evening at Galerie Argentic, Paris. © Galerie ARGENTIC. The prints are on display at Galerie Argentic 43 rue Daubenton 75005 (in the 5th arrondissement of Paris) until 20 June 2015. 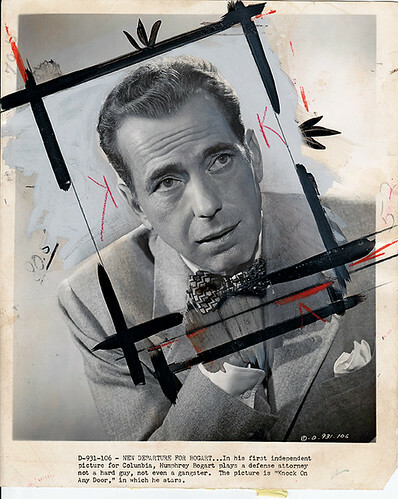 The prices range from €350 to €2000 for the image of Humphrey Bogart that graces the cover of Pellicer’s French-language book about his collection, Version originale: La photographie de presse retouchée. Humphrey Bogart after retouching (to remove hand and cigarette). A Columbia Pictures promotional photo by Robert Wallace Coburn for the courtroom drama Knock on Any Door (1949), directed by Nicholas Ray. See ‘The retoucher’s accidental art’ by Rick Poynor in Eye 88.